Identification: This species has a translucent gray body decorated with white, chrome yellow and velvet black spots. Clusters of black spots define scallops on the sides of the parapodia and the rhinophores are tipped in brick red. There is an irregular white marginal line on the parapodia that's overridden by yellow spots. Natural history: Thuridilla sp. #3 is a moderately common species found in moderately protected to moderately exposed rocky areas at depths of 1-8 m (3-26 ft). However, it's rare at depths over 3 m (10 ft). It may be seen resting in the open both by day and night but we've only observed it crawling actively in late afternoon, suggesting that it may be crepuscular. The egg mass is a variably coiled orange spiral with evenly spaced dark orange granules of extra-capsular yolk running down the center of the ribbon. The eggs hatch in about 5 days in the laboratory and the granules of extra-capsular yolk remain in the ribbon after hatching. Distribution: Big Island, Maui & Kauai. Taxonomic notes: First recorded in Hawaii from Hekili Point, Maui by CP in Sept., 1990. 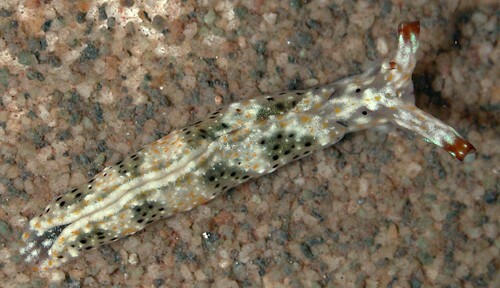 Photo: CP: 6.5 mm: Hekili Point, Maui; May 1, 2004.